"To help heal this situation, see the other person's point of view with compassion." This misunderstanding has occurred because of judgements about the other person's motives and character. To heal the situation, the judgements need to be released. Instead of seeing someone as "good" or "bad", have compassion, and know that everyone is doing the best they can. Instead of pitying someone, see that person's inner strength and Godliness. In that way, you encourage Divine light to be expressed within the other person and yourself. You are projecting something from your own shadow side onto the other person. So, this situation is an opportunity for you to clear away an ego issue. Simply affirm: 'I am willing to release that part of me that is irritated when I think of you.' 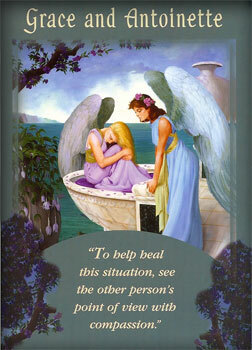 We angels are helping to heal this situation miraculously so that everyone will forgive and forget judgements and act responsibly. Compassion is the key.